Make amazing robots and gadgets with two of today’s hottest DIY technologies. 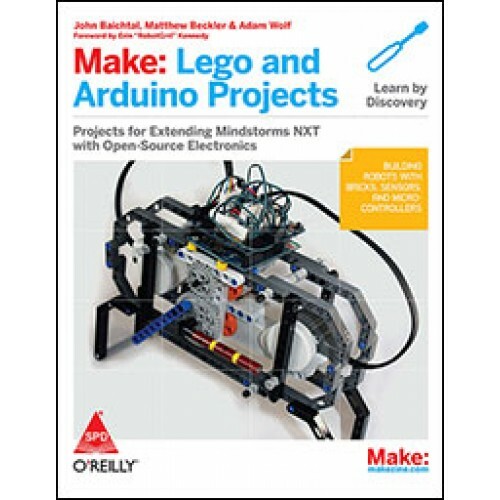 With this easy-to-follow guide, you’ll learn how to build devices with Lego Mindstorms NXT 2.0, the Arduino prototyping platform, and some add-on components to bridge the two. Mindstorms alone lets you create incredible gadgets. Bring in Arduino for some jaw-dropping functionality—and open a whole new world of possibilities. Each fun and fascinating project includes step-by-step instructions and clear illustrations to guide you through the process. Learn how to set up an Arduino programming environment, download the sketches and libraries you need, and work with Arduino’s language for non-programmers. It’s a perfect book for students, teachers, hobbyists, makers, hackers, and kids of all ages. You'll need the Bricktronics shield created for this book by Open Source Hardware kit maker Wayne and Layne, or you can build a breadboarded equivalent (see Chapter 10) for about $25 in parts. John Baichtal is a contributor to MAKE magazine and Wired's GeekDad blog. He is the co-author of The Cult of Lego and author of Hack This: 24 Incredible Hackerspace Projects from the DIY Movement. Matthew Beckler is a graduate student in EE at Carnegie Mellon University, and is a co-founder of Wayne and Layne, LLC, where he makes open source hardware. Adam Wolf is a firmware engineer at an electronic design services company, and is a co-founder of Wayne and Layne, LLC, where he makes open source hardware.